ABOUT US Bicycle Repair Man is a mobile bike repair service providing a convenient alternative to retail bike shops in central Iowa. WHO IS BICYCLE REPAIR MAN? Craig Corson got his start in this business at age 17, helping friends who were selling and servicing Whizzer motor bikes in his hometown of Moline, Illinois. 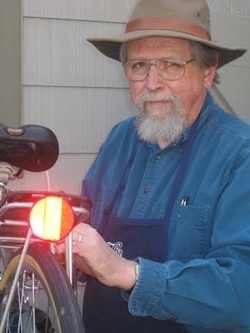 He enthusiastically joined the ten-speed revolution in the 1970s, and fixed flat tires and assembled new bikes in an Iowa Falls, Iowa bike shop owned by a friend. He and Diane eventually bought the place, and taught hundreds of Hardin County residents about the fun of cycling. Thirty years and three bike-related businesses later, bicycles haven’t lost any of their fascination and Craig’s still working hard to keep riders rolling. Craig and Diane Corson are committed to cycling as transportation and recreation, as well as business. After 30 years of bicycle and outdoor industry management and ownership, Diane’s done almost everything from assembling and fitting new bikes to planning trails and teaching safe riding to kids and adults. She currently serves as marketing director, office manager, work scheduler and chief tire-pumper for Bicycle Repair Man. Our commitment to a “cycling lifestyle” means more than just riding for the fun of it – although we do it because we really love what we do. We recycle, re-use and re-purpose whenever possible. We use eco-friendly solvents and cleaners and recycle rubber, aluminum and cardboard instead of throwing it away. We also utilize used parts when practical, and keep discarded bikes out of landfills by reconditioning them. Our new service vehicle, a shiny white Ford Transit Connect is available to pickup. Watch for "Bill" in his bright new wrap job on the streets of Ames and the surrounding area. And look for the other member of our fleet of service vehicles, a custom-designed Bikes at Work trailer. It allows us to move bicycles with human power. Built right here in Ames, we’ll use it for pick-ups and deliveries whenever practical, saving fuel and utilizing bikes in another unique way. NEED TO DROP OFF A REPAIR? Our shop is located at 811 Kellogg Avenue, 3 blocks north of the main post office in downtown Ames. We’re easy to find – it’s the only address in the block with a bike rack out in front! You may bring your bike to us any day of the week. If we aren’t around to greet you, please follow the drop-off instructions posted on the porch. WHAT IF I CAN’T BRING MY BIKE TO YOU? No problem. Just give us a call, complete the form at the top of this website or send us an email, and we’ll come to you. If it’s something simple (such as a flat tire) we’ll do the work at your location, while you wait. If it needs work that’s more complex, we’ll take it to our shop and return it to you when it’s fixed. We charge a fee for pick-up and delivery in the Ames area, plus the cost of repairs. We accept all major credit cards as well as cash or personal checks. 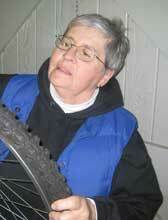 We gladly accept donations of good used bikes, which we check over and restore to safe operating condition. Some of these are donated to riders in need through local organizations and churches working with area families. Others are posted in our "For Sale" section, providing low-cost transportation and keeping good bikes out of the landfill. A portion of the sale price of every used bike is donated to trail development projects in Iowa. Some of our favorite trail-building organizations including: Story County Conservation, Iowa Natural Heritage Foundation, and Rails-to-Trails Conservancy. We are currently working with residents of Dallas and Boone Counties to raise funds needed to complete the last section of trail linking the Raccoon River Valley and High Trestle Trails. Connecting these two major recreational trails in our part of Iowa will create a major destination for riding enthusiasts and will provide a much-needed economic boost to trail towns. WHERE DID THE BUSINESS NAME COME FROM? Craig’s a longtime fan of the classic British comedy series Monty Python’s Flying Circus. His all-time favorite Python skit is set in a community of Superman look-alikes, with one member leading a secret life as, of course, “Bicycle Repairman.” Naming the business after that character seemed pretty obvious. Mighty Maz, our service truck for more than 15 years, was a 1987 Mazda that ran on a lot less fuel than a new vehicle and picked up and delivered bikes with efficiency when it wasn't practical for customers to bring them to the shop. Mighty Maz finally retired from our service team in late 1914 when his rusted frame split while on a mechanic's hoist. We miss Mighty Maz, who put in nearly 60,000 miles of hard work with very few demands.